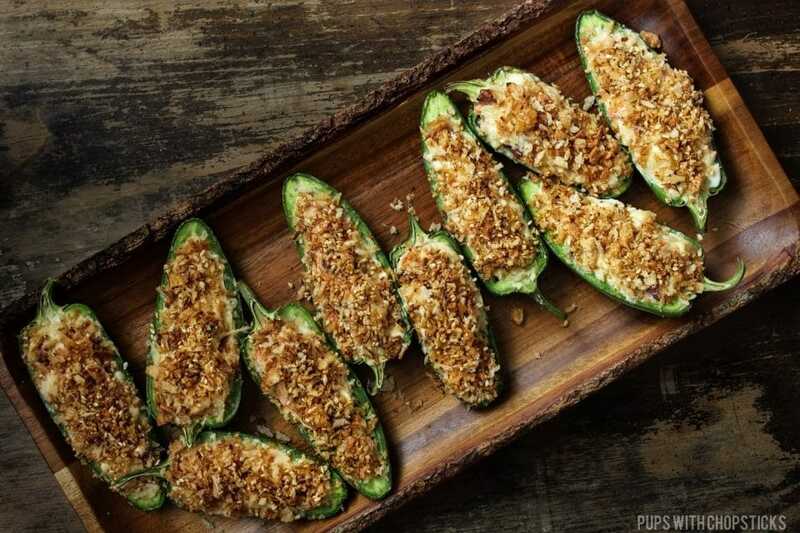 Oven roasted cream cheese stuffed jalapeno poppers filled with cheesy crab and Chinese sausage filling with a crispy sesame, onion topping. East meets West kinda snack with flavours that will tickle your taste buds! What do you get when you cross a jalapeno popper with crab rangoon? 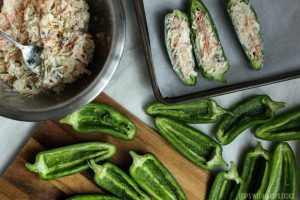 A crispy cream cheese stuffed jalapeno poppers stuffed with cheesy crab filling! This is what happens when I have weird snacky cravings, I just combine them. 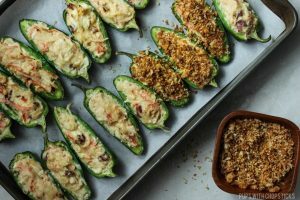 These are not your average cream cheese stuffed jalapeno poppers – I broke tradition and didn’t use bacon and instead used Chinese sausages (aka Lap Cheong) to give this a slightly smoky, sweet and salty bite, however if you can’t find Chinese sausage, you can replace this bacon. 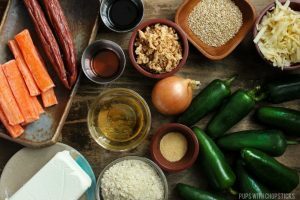 For this cream cheese stuffed jalapeno popper recipe, most of these ingredients can be found at a local grocery store, with the exception of Chinese Sausage (Lap Cheong). 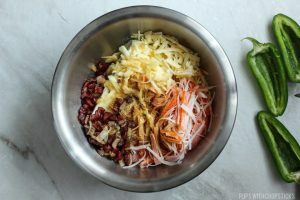 To make the crispy topping, a combination of panko bread crumbs, deep fried onions and toasted sesame seeds are toasted together with a bit of sesame oil. Japanese panko bread crumbs are not as finely crushed as normal bread crumbs and give a bit more texture and crunch. I used deep fried onions\shallots, which I find at Asian grocery stores however, I have also seen French fried onions in containers at my local grocery store as well. I find the easiest way to de-seed and de-vein jalapenos is with a spoon. I’ve had my fair share of spicy knicks and cuts using a knife – not a very fun experience. 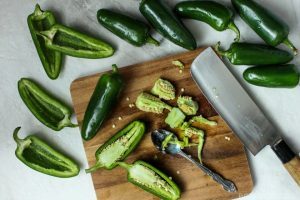 After you slice the jalapenos in half length wise, jab the spoon at the very top near the stem where all the fleshy spongy bits are and scrape down to get started. Once that big piece is out the rest is a breeze to scrape. 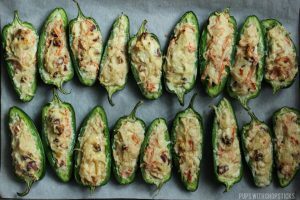 If you like a bit of a spicy kick to your cream cheese stuffed jalapeno poppers, remove the seeds but don’t fully scrape out all the white membranes. On the other hand, if you prefer to go the milder route then make sure to remove as much of the white membrane bits as possible. When you are roasting these little guys, keep an eye on it. Our goal is not not overcook it. We want the peppers to still have a bit of a crunch to it. When the jalapenos are overcooked, it releases water and you end up with a drippy water logged cream cheese stuffed jalapeno. Gross. 12-15 minutes was plenty for me but this is dependent on your stove. 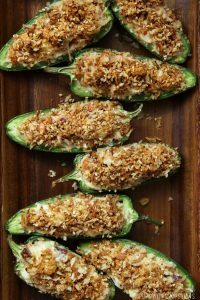 Once it is brown, remove it from the heat and set it aside for topping the jalapeno poppers at the very end. When de-seeding the jalapeno, be careful not to breathe in the spicy fumes around the work area – not pleasant at all. For a slightly spicier jalapeno, don’t fully scrape out the white membranes from the jalapenos, only remove the seeds. For a less spicier jalapeno, scrape off the seeds and the white membrane completely. 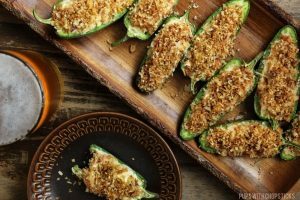 This Crispy Jalapeno Poppers recipe is good. 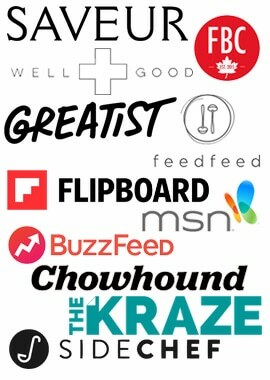 I followed all your ingredients+ added more roasted sesames that I like. The aroma of popper food everyone loves to eat. Looks so good.. I first tasted some Jalapeno poppers in Chiquittos a few years back.. Since then it has been one of my favourites. These are so tasty! Love a good popper! Yum, these look so delicious. They would be perfect for a side dish during the holiday months or during a game. Wow. 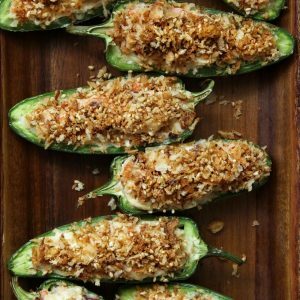 As if jalapeno poppers couldn’t get any better. I like the new flavor twist and that you didn’t deep fry anything! I love the spicy and crunch version of these poppers. They look beautiful too.